"Mummy, lets go and get the Christmas tree", demanded Rohit, a 7-year-old son of a simple homemaker Mamta residing at the Mumbai city. It was two and a half days left for the Christmas eve and little Rohit was excited about the Christmas festival. Mamta wondered being a Hindu, what was so special about the Christmas tree that her son was so excited about because they had already celebrated the grand festival of Diwali in November, with all the relatives around, relishing all the savories and delicacies made for Diwali. She could not understand why Rohit was so adamant to celebrate the Christmas festival this time. But as a lovable mother she wanted to satisfy Rohit's demand as there was no harm in fulfilling her child's innocent demand! Mamta took Rohit to the gift shop and bought a medium-sized Christmas tree with all the decoratives alongwith. At last Rohit was very happy as his wish had been fulfilled without any resistance from his mother's side. He sat whole day decorating the Christmas tree quite passionately. Mamta was cooking dinner when Rohit entered the kitchen and cried out loud, "mummy, I have decorated my lovely Christmas tree very well, can you make a chocolate cake tomorrow?" Mamta was very good at making cakes, especially chocolate cakes which were Rohit's favourite, so she happily agreed to do so. 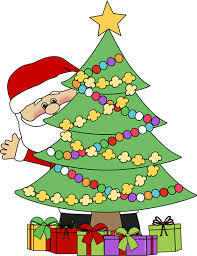 It was the 24th December, and at last the Christmas eve had arrived, for which Rohit had bought the tree! Today Rohit was quite eager for the day to end and the night to arrive. He was singing Christmas song of 'jingle bell, jingle bell,.....' and was checking out with his mother whether she was preparing his special cake. At last a big chocolate cake was prepared. Finally the clock struck 9.00 pm and Mamta called Rohit for dinner. He immediately finished his food and started dancing on the song, 'jingle bell jingle bell,jingle all the way....'. His mother was very excited too, seeing her son so excited. After sometime it was bedtime and Rohit removed his old stocking which he had since 2 years and placed it besides his bed. Now it was bedtime,and as usual Rohit jumped on to his bed to prepare for a good night's sleep. Usually he used to fall asleep within ten minutes, but this time it was different. He was not feeling sleepy, nevertheless he was getting restless. Mamta asked Rohit, "what happened son, what is wrong with you? Why are you not sleeping?" To this Rohit replied, "Mummy, when does Santa come to give us gifts, I want to see him putting gift in my stocking!" At this Mamta was wondering what to tell him, as she was planning to put his gift in the stocking when he would fall asleep. Now from where is she going to call the Santa Claus? "hmmm",she replied "Rohit dear, please go to sleep, Santa uncle does not come when kids are awake, as he does not want them to see him, you want your gift,no?" "No, I cannot sleep without seeing him, let alone the gift, I want to see him with my own eyes, the way he looks and talks to me, please mummy, let me be awake to see Santa uncle." Now Mamta was in a fix, she could not think of anything else but call up her husband, Manoj who was going to work till late night in the call center. She rang him up and told about Rohit's problem. He laughed and told her not to worry, and that he would take care of it. In all this mess, Mamta could not understand Rohit's stubbornness to see Santa Claus, she could not understand the whole idea of Rohit making a demand of the Christmas tree and watching Santa with his own eyes, what's the catch, she wondered! it was just a single knock every time. Again a third, then a fourth, and when the fifth was heard she decided to open the door! With a brave heart, Mamta got up from her chair and entered the living room to open the door. This time Rohit was also scared a bit so he accompanied his mother. When Mamta opened the door, what did the two see,"Vow, Mr. Santa Claus himself. He was wearing a red robe and a red cap. He was wearing a white beard and moustache and had silvery white eyebrows which were quite thick, but he did not seem as fat as shown in movies and pictures! "Oh, my God, Santa uncle are you here in real", uttered Rohit with great excitement and disbelief, but Santa uncle did not respond and instead kept smiling. He then went straight into Rohit's bedroom and put something in his stocking, shook hands with him and then with a flying kiss bid goodbye to Rohit and left the house. Mamta wondered about this person as actually Santa Claus is supposed to be fictional. She bolted the door and then quickly hopped into Rohit's bedroom, and what did she see, Rohit sitting upright on his bed with chocolates and a beautiful color box in his hands. "Look, mummy, see what Santa uncle has given me, I am thrilled", Rohit said. It was quite late by then, almost 1o'clock, and Mamta was also feeling sleepy, so she asked Rohit to go to sleep, lest he should not fall sick, waking up late at night! After sometime Rohit fell asleep. Mamta was napping in the chair when suddenly she realized Manoj had not come home and it was quite late by now? Mamta was feeling anxious and so she called him up to ask where he was. "I am right at the main door Mamta,can you please open it dear, I do not want to ring the bell as Rohit might have slept by now", Manoj replied. Mamta was quite surprised and immediately opened the door, and to her surprise she saw Manoj wearing the Santa Claus robe and holding a white beard and moustache along with white eyebrows in his hands! "Dear, has Rohit finally slept?" enquired Manoj. "Yes", Mamta replied. "Finally, Rohit has got what he wanted from Christmas!, but how did you manage to do this makeup",asked Mamta. "Oh, I had dropped at my friend Varun's place and he and his wife helped me with it! ",Manoj said cheerfully." "I do not understand why Rohit actually wanted to meet Santa Claus", questioned Mamta, perhaps she was searching for an explanation from Manoj which she knew he also would not know! "Whatever, our son is happy and satisfied, after all, what else do we need,come, please serve me some dinner, I am hungry" said Manoj. After all the chores got over, Mamta went into Rohit's bedroom to check if Rohit was sleeping comfortably, when she saw something fallen on the floor. It was a photograph of his grandparents, and might have fallen out of the family album. She went to rearrange it in the album, when suddenly, she noticed, that actually Rohit's grandfather had a white beard and moustache which was somewhat smaller than what Santa had and his eyebrows were silvery white". "So this was it! ", Mamta thought. Rohit was missing his grandfather today, as Santa Claus seemed to resemble his grandfather, after all Santa is depicted as an old man with a white beard and moustache and white eyebrows and ushers children with lots of gifts which grandfathers love to do as well. As tears rolled down her eyes, Mamta realized the subtlety behind Rohit's demand and could gauge the love of her son for his grandfather. Rohit might be missing his grandfather on festivals, especially the Christmas eve, she thought. So she decided to celebrate the Christmas just like other festivals, with the Santa Claus being Manoj so that Rohit never ever missed his affectionate grandfather on the Christmas day ! Mamta then realized how sometimes, children teach us many things in life. If we learn to respect our children and understand them as we want them to understand us, our children will always trust us with their best secrets in life, which may sometimes be quite angelic and ardent and with them we can live those magnificent moments in our life! Thanks for reading my story and appreciating it so well.i am happy that you have enjoyed my story,thanks again! Comment with a name will be appreciated. Often comments without names will not be published.